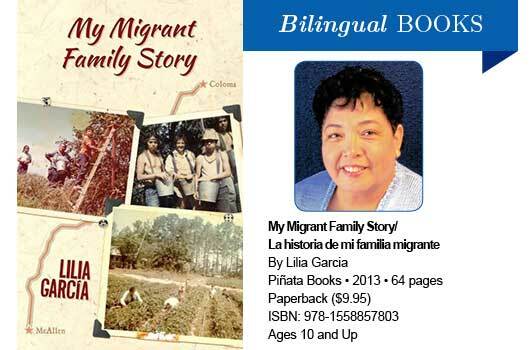 In this series of autobiographical vignettes, Lilia Garcia provides readers with snapshots of the trip her family of migrant workers took each spring to Colma, Michigan. From their hometown of McAllen, Texas, the Garcia’s made the 1,500-mile journey in a 1965 Ford pick-up truck. In the north, they picked summer crops until early fall. As the youngest of eleven children, Lilia was too young for fieldwork and was sent to school, where she often felt isolated and fell behind in her studies due to the frequent school changes that resulted from the family’s migrant lifestyle. Using the voice of a young Lilia, Garcia’s detailed narrative provides readers with a strong sense of place by recounting how the dishes were packed in the camper (they went first), the sleeping arrangement of their house in Michigan (the girls shared two double beds), and how her class made ice cream one year. Together, these vignettes paint a realistic picture of this migrant family’s life, and the strength they drew from their love for one another to overcome life’s obstacles. Appropriate for upper elementary and middle school readers, this book may sit side-by-side with others on the same topic, such as Going Home by Eve Bunting (HarperCollins), First Day in Grapes by L. King Perez (Lee & Low), and The Circuit by Francisco Jimenez (University of New Mexico Press). —Reviewed by Maria Mena, Library Science Professional.